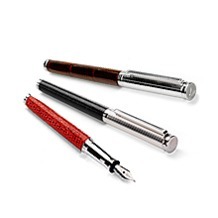 The art of writing is flawlessly captured by our collection of Men's Silver Pens. Imbued with one hundred years of expertise, they are hand crafted by world renowned pen makers to uncompromising standards. Choose from sleek sterling silver or the refined appeal of an Italian calf leather barrel, designed in an array of stylish shades. Designed to last a lifetime, durability goes hand in hand with design, displayed within the exquisitely detailed finish and exceptional construction. Aspinal stunning collection of Silver and Leather Pens for men include both Silver Fountain Pens and Sterling Silver Rollerball Pens. Every pen has been meticulously hand crafted in Germany by the most renowned makers of fine writing instruments since 1918. 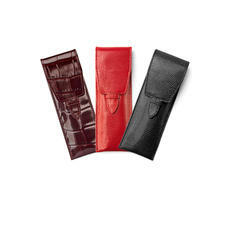 Each pen is an outstanding example of style, durability and refinement. We offer a beautiful array of barrels in striking colours of Aspinal signature lizard print leather, croc print leather or solid sterling silver to suit the classic or contemporary taste. 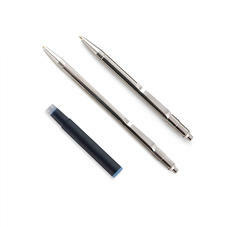 The internal mechanism of each sterling silver pen is made in brass and then rhodium plated to avoid tarnishing. Rhodium plating is expensive technique which is normally only applied to the highest quality precious jewellery. All our Sterling silver pens are hallmarked in the UK with Aspinal own unique stamp. Each silver pen is presented in an Aspinal blue lacquered solid wood presentation box and comes with a guarantee. 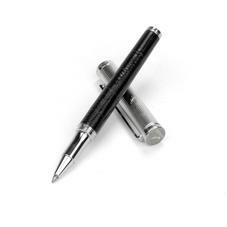 For that extra special personal touch, all of the pens in our Mens Silver Pens collection can be personalised with up to four initials.